For this week I decided to try two different types of paint making processes, egg tempura and watercolor. The process of making my own paint from natural pigments is what first drew me to the Sustainable Art School. In addition to being an artist, I am also a massage therapist and spiritual / energetic body worker. I began studying meditation and shamanism in Washington D.C. in 2009 with the Luminous Warriors, however it wasn’t until I traveled abroad to South America that I began to understand the depth of my own interconnectiveness with the land and the Earth. As I began to walk more fully with my spiritual path to be in alignment with the Earth, I began to realize that the way that I was digesting my experiences through the creative process of artwork was not in alignment with the environment. The majority of my art practice was using acrylic paints which is made from basically a type of plastic. Though I was painting and interpreting my experience, when I would go to remote sacred places in nature such as the mountains of Sierra Nevada or the jungles of Peru, I became conscious that it was not the best thing to dump my used dirty water down the drain or among the plants of the Earth. Part of the deepening of my inner journey durning this walk about focused on visiting different sacred places in nature and filling myself with the vibration of the place. I kept a mesa which is a prayer bundle of stones that I would collect and offer at different places along my journey. Often within my paintings I would use the water of a local spring, waterfall, or the ocean and I would feel that by using each particular water of the area that my paintings would take on an additional energetic quality or imprint of the location. I wanted to take this idea to the next level to create even stronger energetically charged paintings. While I was working in a crystal shop in Nyack, New York, I began to learn even more about stones and crystals. I became exposed to raw lapiz azul and other stones with softer hardness. I remembered that the Egyptians use to use lapis as paint and also as eye make up. Understanding the spiritual properties of stones I now wanted to create paintings made from these precious gems with spiritual intention. ​For this week I chose to make egg tempura from turmeric powder and from beet powder. To do this process I simply took the powder and added the egg yoke and a little bit of vinegar to help preserve it. The process of the egg tempura was very nice in the sense that it created a type of semi-glossy feel to them. The turmeric powder was more smooth where as the beet powder was more granular. I think I could have grounded the beet powder more for it to be more smooth in texture. 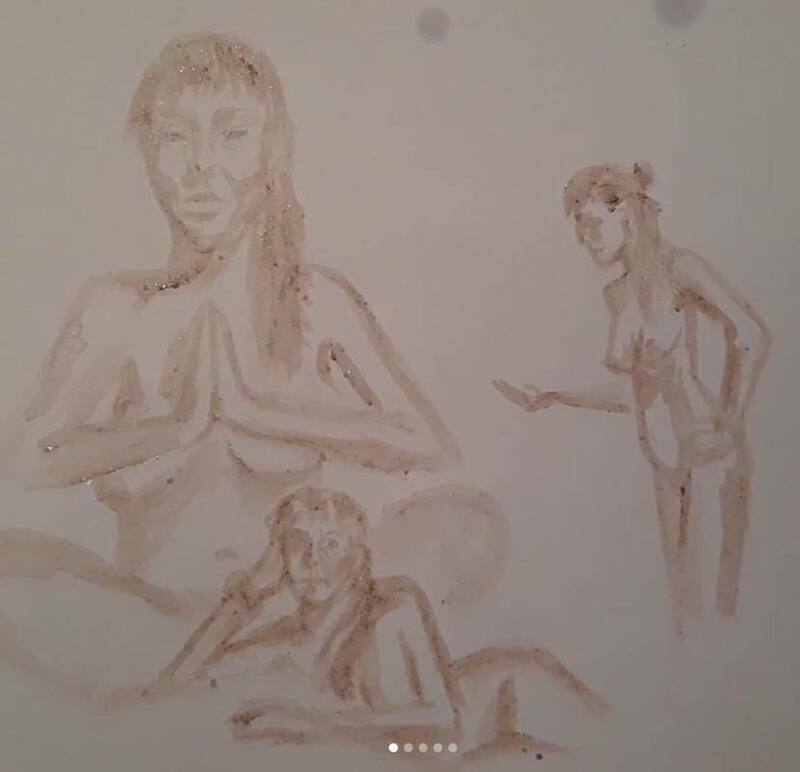 I also tried to make watercolor from both the turmeric power and the beet powder. To do this I boiled them down in water, added gum Arabic, vinegar, and let the rest of the water evaporate on my radiator. For the beet powder I ran the boiled mixture through a type of cheese cloth to remove some of the larger particle material as an attempt to get a smoother paint. 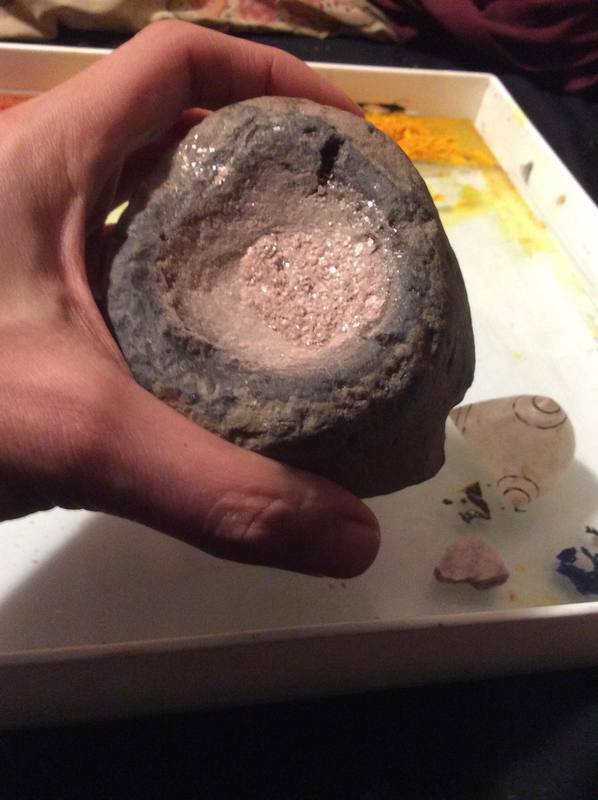 I also decided to try to make paint from the stone lepidolite mica. It is a semi-soft stone that is layered and reflective. It comes from Brazil and it is said to have medicinal properties for anti-anxiety, peace, and tranquility. I decided to make this stone into a water color so that way I could re-activate the paint if I did not use all of it in this one sitting. With egg tempura, I realized I needed to use all of the paint I made at the time of creation because once it is dried I could not reactivate it with water. With this stone I grinned it down using a quartz crystal and another stone that had a natural rounded basin in it. I then added a drop of gum Arabic and water until it became the consistency that I desired. The color of this stone is a light lilac color. When I used to paint with my mixture the color was more of a light brown, close to the color of the gum Arabic but did have a slight light purple tone to it. I do not know if the color of the paint I created was due to the gum Arabic or what. I wonder if there is another binder that does not have a brownish color to influence the color of the paint. A really nice result of using this paint from the lepidolite stone is that it has a reflective nature to it and still has particles of mica that shine like glitter against the paper. These are some photos of the artwork that I made using these paints. My other question is, particularly when working on bark, what pigment can I use to create a white? I am thinking maybe shells? Or possibly bone? ​I am looking forward to exploring more with simple inks! The two inks that I decided to try for this week’s experiments were coffee and beets. I also wanted to try the black berries, however when I went to pick them, they had already passed in season. The reading said that the best ones for ink are the big fat juicy ones, and by the time I arrived at the wild blackberry bush they were all dried up. I picked some dye ones to experiment with but I haven’t had the chance to work with them yet. 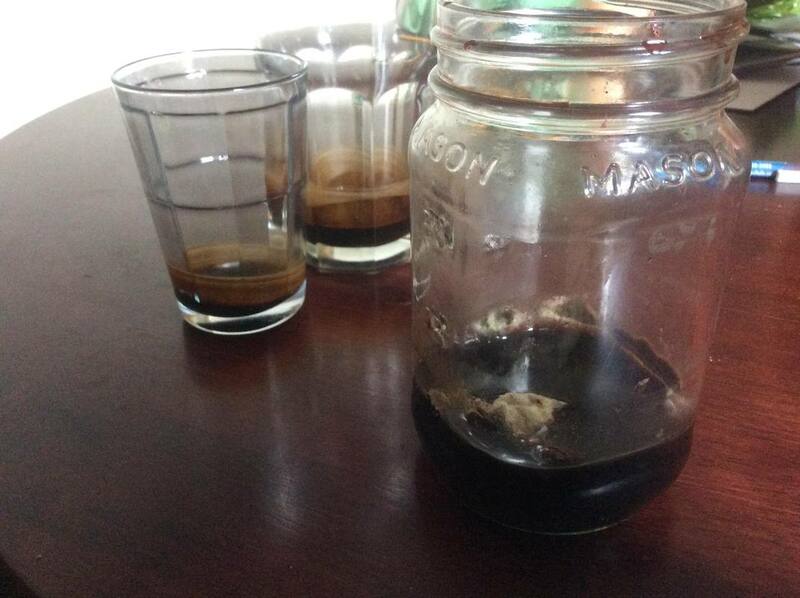 Starting with coffee, I used some old coffee grounds that I found in the fridge. I use to be an avid coffee drinker but I am trying to cut my intake down so now I have a lot of coffee that I am not going to drink just laying around so this is a new and perfect way to repurpose all of my coffee grounds! To make the ink, I boiled water and put it through my coffee strainer as if I was making a normal cup of coffee. I got this really great re-useable coffee strainer when I was in Japan last year. They also use them a lot in Costa Rica. It is basically cheesecloth on a metal hoop for a single cup serving. ​Right with my first fresh cup of coffee I did one paintbrush color test to see what the coffee color ink looks like fresh. After that, I boiled down the coffee liquid until it became a dark brown. 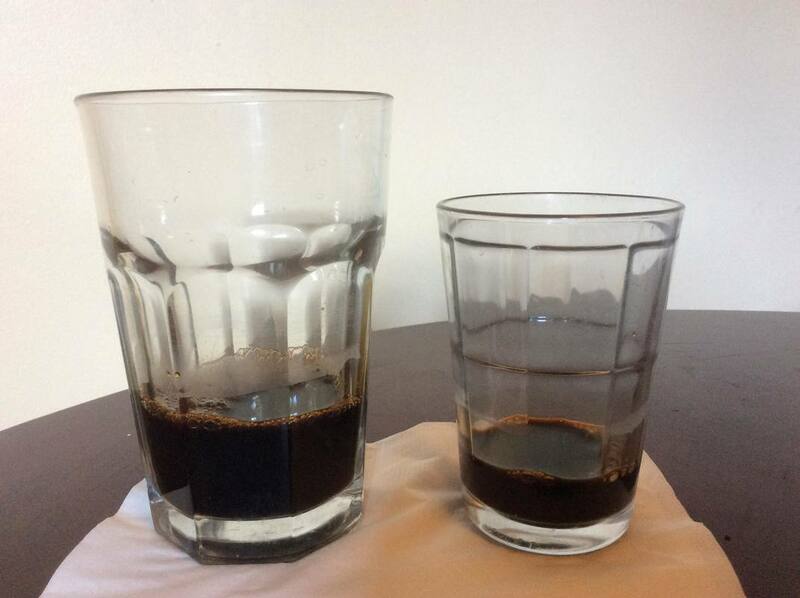 I then I let this condensed coffee evaporate on my radiator for a few days, layering it in thin layers at a time until it became glassy and dry. I used this coffee mixture in a painting by reactivating it with water when I wanted to use it. I used this ink to dye fabric of an old sweater that I then used to collage on to my canvas. 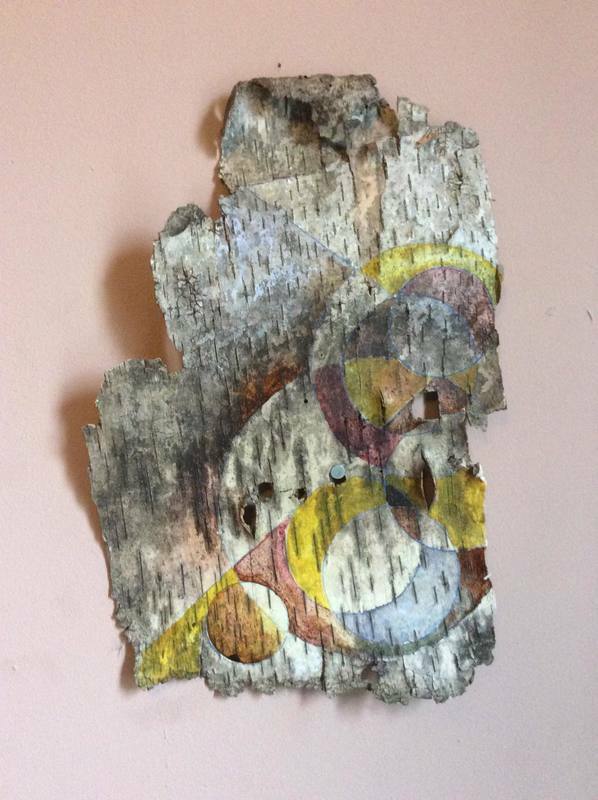 I also used it to paint directly on birch bark. I really like the shininess and texture of the coffee ink. It has a beautiful shine that really feels alive and has a great smell that is so invigorating when using it! ​The other ink that I experimented with was beet. For beets I went to the grocery store and purchased a few…. If I was living on a farm and there were extra, that would be ideal…but that was not the case in this instance. I was really excited to work with beets because 1: they are delicious and 2: I love their purple-magenta color. 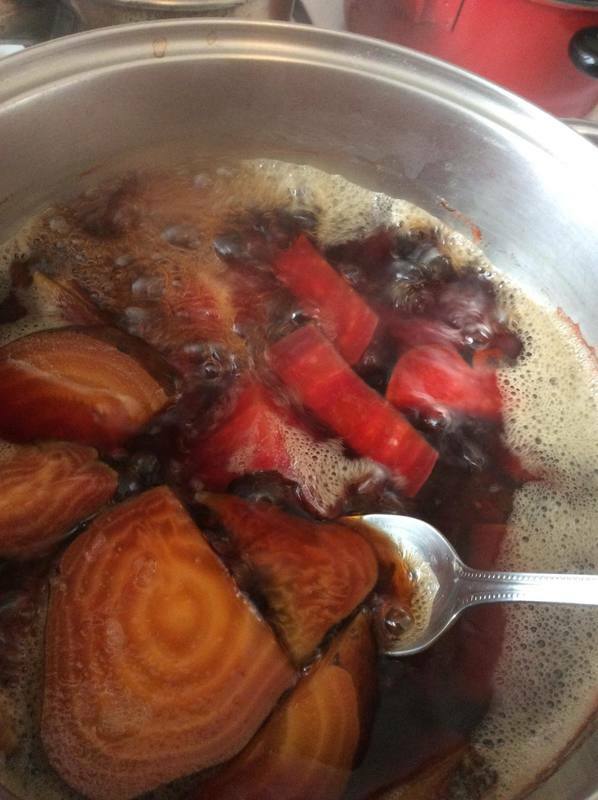 To process the beets, I boiled them down as directed in the readings. I boiled and boiled them until they lost all of their color. I was curious of the color maturing process that they would go through so I made my first mark with the freshly cut beets to compare throughout the process. I then made a mark with the boiled down beet liquid. I added salt to this liquid and then let it also rest on my radiator for 5 days to condense the color. After 5 days the beet liquid grew white mold fuzz on the top of it. I did not have vinegar, as the reading suggested that could help with preservation, so this could be one factor as to why the while mold grew on top of it. ​I still used the beet color ink with the mold. I just skimmed off the mold and proceeded to use it as normal. There was no foul odor to it and the color was still strong. As the beet ink matured in this process, it went from more of a pink to a brown. I also used this ink to dye the fabric I used in the same painting I also used the coffee ink. Comparing the colors, I notice that the beets do not have the same shine as the coffee ink and also that the coffee ink is much darker in color. Also after applying the ink to the fabrics, it seems that the coffee stayed more vibrate where as my beet color, when dried, faded substantially. Hello Everyone! Madeline Lynch here from the United States. I am a 30 year old artist, adventurist, and graduate student at Teacher's College, Columbia University, located here in New York City. In my masters program I am currently studying the bridge between psychology and spirituality from a Western perspective. I believe in primary scource & direct experience learning as education. I have a strong interest in nature and love her for her beauty and great teachings. I believe the natural wold holds the keys for spirituality/consciousness, and understand what it means to be human. As an artist, acrylic paint, industrial water colors, and store bought oil paint has been the main medium that I work with, particularly due to the fact that that is what is available to me and taught to me as art making materials from my culture and era. As a kid and young adult, though I recognized that paint and color had to come from some where, I never really gave it a second thought until a little later in life when I was trigered by building my medicine bundle and I was asked where my stones came from. Through this new questioning, I also became more aware of the signatures that my materials carry... Signatures meaning: what is the product or material made out of? how the product was processed and made? how far it took to get to me? the molecular structure of it? the structure and collective conscious symbolic signature of it? Traveling outside of the USA opened my eyes and ears to sense materials and products differently. I saw people build beautiful woven jungle roofs from sticks and palm branches, or homes and stoves made from mud and hay. I also saw many things being creativity and innovatively repurposed... like big leaf for an umbrella, lawn motor engine for a boat engine, or plastic bottles stuffed with plastic wrappers to build walls.. all kinds of stuff. However, as an artist, I would also bring my own acrylic paints on my journeys... and I realized after awhile, even pouring out the cups to wash them was harming the beautiful environment that I was living in and getting to know. I was using acrylic paint which is basically chemically dyed liquid plastic..... I realized I was part of the problem. And to me, as a visitor I would maybe never see the long term effects on the environment but to the natives who survived off the land, this was not the case. Living there, and getting to know how the life works there, I easily and fully understood that the health of their land is the vitality of their own survival. However, ... in other communities they are like I was, unaware. Because some of these industrial materials are new to them, they do not know the harm they cause when these plastic materials are treated the same way they use to treat organic wastes.... In the not too long past, people would wrap their lunch in a banana leaf and throw it on the ground. There, it decomposes with no harm. Now, plastic has become the new sandwich wrap - the new banana leaf, and when treated the same way, thrown on the ground, it will not just disappear back into the Earth. In small villages in Ecuador Ive smelled and seen people burning plastic and using weed killing poisons like Round Up because it is cheep and they do not know how harmful it is to their health. Anyway: So both of these factors has more than sparked my interest in discovering more about natural and sustainable art making processes. I know, or at least hope we can do better. On top of all this: I want to become a teacher. I want to learn how to be a better educator and to present art making as a tool for expression and healthy emotional living as it has been for me all my life. 1) I am interested in created deeply meaningful and powerful artwork that holds energetic signatures. I feel that by learning the process to make paint and inks from different plants and stones I can develop a more intimate relationship with my paintings by understanding where the materials come from and the beauty of nature itself. I feel the artwork that is made from organic and found materials still hold the story and frequency of the life it has lived and seen, and I find this fascinating. 2) I am interested in harming less of the Earth. I want to be more authentic with my relationship with the Earth & Natural environment and still continue to keep myself healthy by expressing through visual arts. For this course this summer, I will be organizing small classes and workshops a few different locations throughout the weeks, including at an artist studio in SoHo, an herbal elixir lounge / community space in Brooklyn, and at a library in Puntey, Vermont. I plan to be working with an adult population of students pulled from friends, and friends of friends who are also interested in sustainable art making practices. I do not know exactly how these workshops and classes will benefit this population yet, however I hope that it stimulates an interest for sustainable art practices and makes these methods more accessible to more people and communities.